In our Archived Memories series of articles, the developers of the Android universe take us behind the scenes of the not-too-distant future. We may learn how different artists work to bring the Android setting to life, or we may learn how the different games set within the worlds of Android are influenced by its setting. 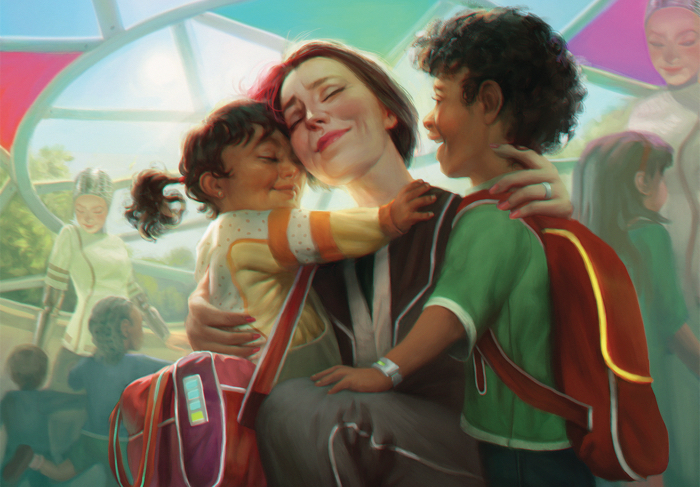 The influence that the Android universe has upon the games set within it was the subject of our last article, in which we interviewed Lukas Litzsinger, the game designer responsible for updating Richard Garfield's classic Netrunner design to fit the Android universe and Living Card Game® model. It is also the subject again today as we present another closely related interview—this time with the new lead developer on Android: Netrunner, Damon Stone. Damon Stone stepped into the lead developer role with his work on the Flashpoint Cycle, but his roots in Android: Netrunner go much deeper. He has contributed to the development of multiple cycles and draft sets, as well as the stories behind several of the game's most recognizable runners. Moreover, his work in the Android universe extends beyond Android: Netrunner, as he was the lead developer on Android: Mainframe, the free-for-all contest between rival runners. FFG: You recently took over the role of lead developer on Android: Netrunner from Lukas Litzsinger. Since that time, what percentage of your time on the game would you say is devoted to exploring its themes and stories, rather than focusing on the introduction of new mechanics? DS: I'd say that it is roughly fifty-fifty. I really try to immerse myself into the setting and spin out ideas of what the Android version of different places or concepts might be and how they would impact society. The specific mechanics for cards frequently suggest themselves from that point. FFG: Can you share an example? DS: One example is Palana Foods (Business First, 30). Whenever I explore a new location, or ponder a new question, the research I do starts to inspire cards that fit into what we know a faction needs and may even help suggest new effects that can fit within that faction's domain. 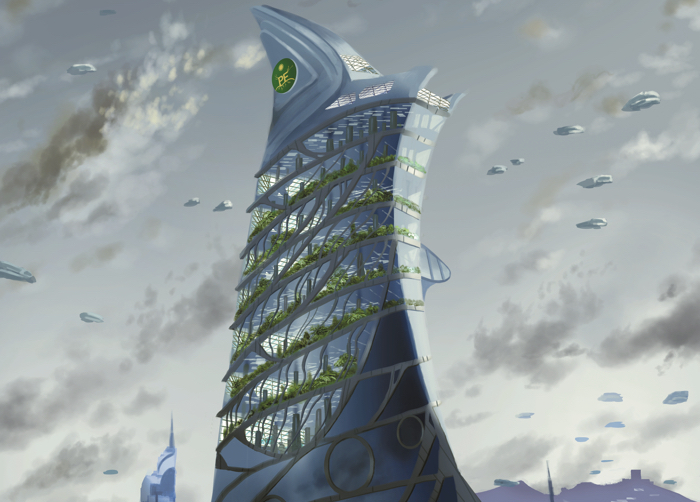 As I was doing research for the Mumbad Cycle, I was looking into factory farms, genetically modified food stuffs, and what it would take to feed a world that is struggling with overpopulation. The idea that Jinteki would step in was only natural, and was explored earlier in the novel Strange Flesh. Also, the idea that not all divisions and subsidies of the corporations are “out to get the small” was something that Lukas and I were very clear on early in the creation of the game and its expansions. So a Jinteki division that was essentially creating super foods to feed not just the Indian Union, but significant portions of Asia and the Middle East was exactly what was needed, especially when that division was doing the work cleanly and humanely, and without it, untold millions would starve. The question, then, was how to explore that in an identity. And then the answer presented itself: gain a credit the first time each turn that the runner gained a card. It symbolized Palana's ability to make a profit whenever Runners fed their hands to keep themselves healthy. That idea then led to a few other cards where Palana “fed” the Runner… and, in many cases, overfed the Runner. FFG: It sounds like Palana Foods started with the theme, but you mentioned that there are plenty of cards that start with a faction's mechanical needs. When a card design starts with such a mechanical need, how do you end up deciding how it should be themed? DS: Usually it is a case of the mechanics themselves suggesting something. A piece of ice with a specific subtype, belonging to a specific corp, definitely recalls themes that were established early on. Something that provides money or cards or some form of information the Runnner may gain is frequently going to end up as a job or connection resource. But even there, the different Runner factions have certain card types they tend to favor over others, so Shapers may get a program that does something while Anarchs get hardware with a similar type of effect, each distinguished and themed in their own ways. And, of course, that is where researching into the subject comes in handy. If the cycle takes place in New Angeles, things will be presented differently than if its cards were set in SanSan. FFG: To that end, how important is the overarching story or setting of a set in terms of the design of an individual card? DS: I wouldn’t say that any individual card relies on the setting, but it is more like Pointillism: each card helps create an image, donating a bit of color, which when viewed in context with all the other cards gives you the feel of a piece of the Android universe. FFG: What would you say are the Android stories and themes that interest you the most? DS: The themes that interest me most are the ones which explore the question of what is human. Is it being made of flesh and blood? Do clones qualify, despite Jinteki’s insistence that they are merely biological machines, consisting of proprietary chains of DNA? Is it our brains? Would that mean that bioroids whose minds are modeled on imprints of human minds then count? Is it how we treat each other? Our instincts for social organization and group defense and labor? These are the stories that I find compelling, and you can find some thread of those questions at the heart of most of the stories I tell through my Android: Netrunner designs. 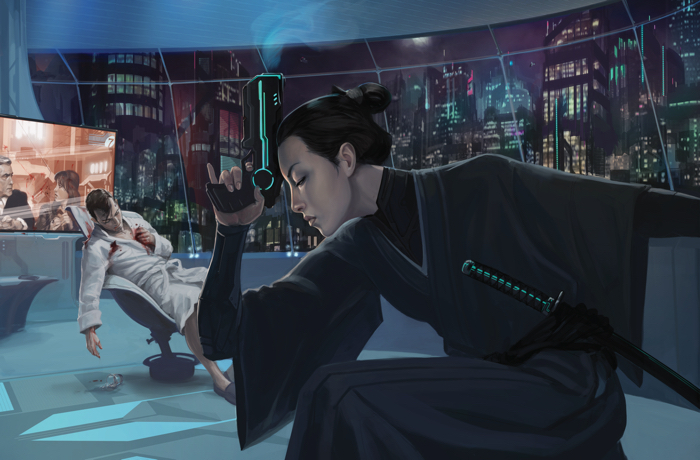 FFG: You talk about telling stories through Android: Netrunner. How do you feel you “tell stories” through a card game that’s a collection of different cards that players can use? DS: Well, obviously, there are the fiction inserts, but there's also the flavor text. Even the art briefs I create for the artists help to create a world which has repeating characters and lots of situations that give small glimpses of a bigger tale. FFG: Do you have any favorite Android characters? DS: Victoria Jenkins, Reina Roja, and Nero Severn. I love the idea that Victoria rose from a small local news program to the heights of running NBN. I love that she is engaged in an internal power struggle with the president of the board, and she runs the multi-planet conglomerate with such style and grace that no one knows that one slip could mean the death of her career… and—because this is Android—it could potentially mean her literal death. Reina Roja is an elite special ops warrior who realized that the government she pledged herself to defend wasn’t calling the shots, that the Corps were. Now she fights the Corps with the skinsuit and skills the U.S. government gave her—the very same skills the Corps had tried to exploit for their own profit. And Nero? His story is complicated and hidden in the shadows. That the Indian Union's premiere info-broker has a hidden past, with deep secrets few would ever guess at, just creates such a fascinating character. FFG: Okay, last question. With Android: Mainframe and the Flashpoint Cycle, you’ve taken an interesting step toward unifying the Android universe, using the defining event of one game to spark a revolution in another. 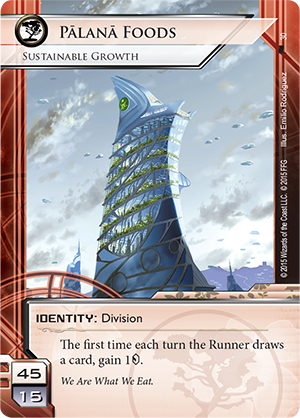 Can you offer any hints about how we may see Android: Netrunner drawing from other Android materials in the future? DS: The Android games really do all take place in the same world. Noise and Caprice first appeared as playable characters in the Android boardgame, and making them both important characters in Android: Netrunner was a great way to show the link between the games. We have both Reina and Victoria appearing in the novellas. 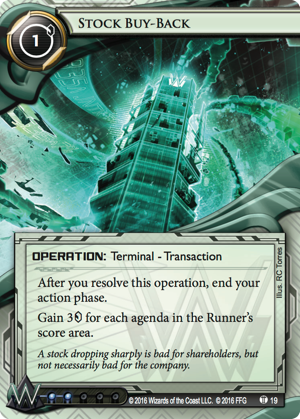 You can definitely expect to see other characters from Android: Netrunner make appearances in other Android properties, and those other appearances will help you gain greater insight into their personalities. The Android universe is an amazingly rich setting, and if you are a fan of it, there are more exciting things just over the horizon, including a new take on the "murder mystery" that was one of the original conceits of the Android boardgame. 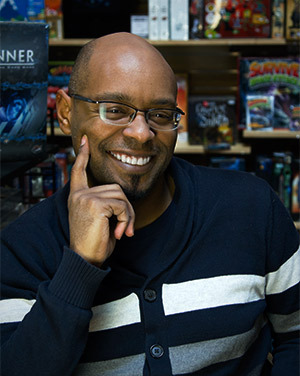 FFG: Thanks, Damon! We look forward to it. 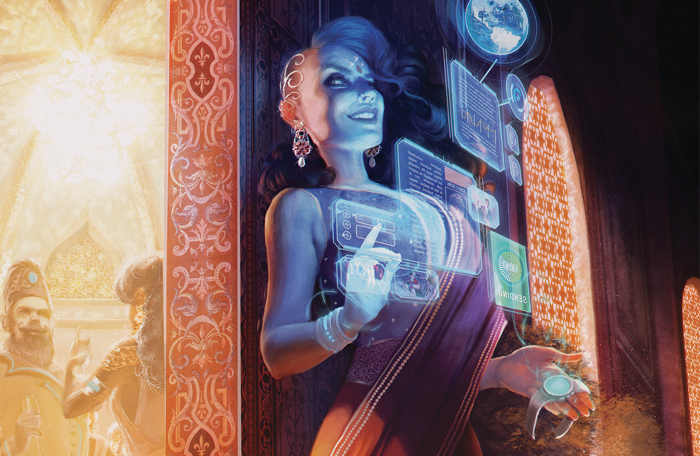 Noise, Caprice Nisei, Victoria Jenkins, Reina Roja, Nero Severn, and more—Android: Netrunner and the Android universe are full of rich characters with sophisticated backgrounds and concerns. Do you believe, like Damon, that by bringing them together in your games, you are discovering the untold chapters of their stories? Is part of your appreciation of the game's cyberstruggles rooted in your appreciation of the depth of the setting's themes and moral complexities? With its new trashable ice and operations, plus its terminal operations and desperate Corps, the upcoming Flashpoint Cycle offers plenty to raise the stakes for all sorts of players, but for those invested in the Android universe and the fates of its characters, you'll find an even richer experience. You'll find yourself back in New Angeles with a chance to lend critical aid to the people you love and support. When the New Angeles economy plunges into chaos, what will you do?